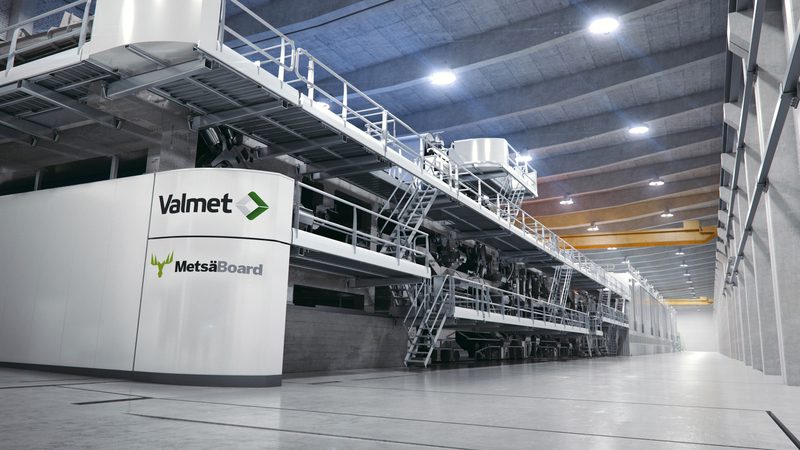 Valmet supplied coated board production line for Metsä Board, part of Metsä Group, has started up at the company's Husum mill in Sweden. The new machine produces high-quality folding boxboard with an annual capacity of 400,000 tons with a basis weight range of 185 - 350 g/m2. "During the project Valmet has operated professionally and we are satisfied with their ability to deliver. We also trust that the new production line will come up to our expectations," says Ari Kiviranta, SVP, Production and Technology in Metsä Board. "Metsä Board is well known for its high-quality, lightweight folding boxboards, used widely in packaging globally. Thanks to the new production line and our recent product development, we are now able to respond to demand better than ever before," comments Mika Joukio, CEO of Metsä Board. This new machine with an off-coater process underlines that Valmet has vast know-how and masters the technique of coated board. Valmet's delivery included a board machine featuring the latest modular design of headboxes, forming section and press section, as well as a rebuild of the off-machine coater, winder and the roll wrapping line. The wet end area of the machine is based on innovative OptiConcept M frame construction without the need for cantilever beams for fabric changes. "We are very happy about the start-up of this new production line and the overall fluent cooperation with Metsä Board. With this project we have expanded Valmet's OptiConcept M family to cover also coated board production. Technologies and know-how related to coated board are one of our strategic focus areas in Valmet", says Sami Anttilainen, Vice President, Technology of Paper Mills, Valmet. Valmet supplied coated board production line for Metsä Board has successfully started up at the company's Husum mill in Sweden. The design of the machine is based on Valmet's modular OptiConcept M production lines. Metsä Board is a leading European producer of folding boxboards and white linerboards made from fresh forest fibres. Its lightweight paperboards are developed as the perfect fit for consumer goods, retail-ready and food service packaging. The pure fresh forest fibres Metsä Board uses are a renewable resource, traceable to origin in northern forests. The global sales network of Metsä Board supports customers worldwide, including brand owners, converters and merchants. In 2015, the company's sales totalled EUR 2.0 billion, and it has approximately 2,600 employees. Metsä Board, part of Metsä Group, is listed on the NASDAQ OMX Helsinki.